The Office of the University Registrar provides official transcripts bearing the Cornell University seal and the signature of the University Registrar. 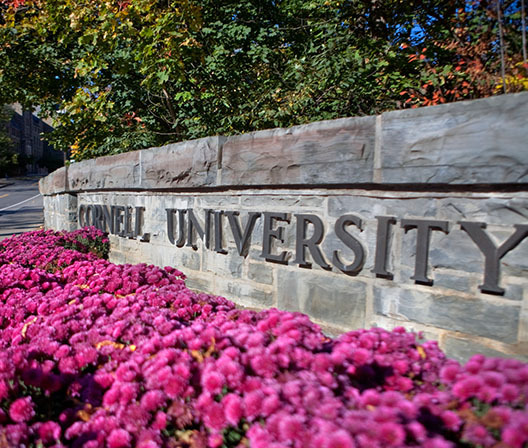 The University maintains a single transcript for all students reflecting all courses taken at Cornell, including summer, extramural, undergraduate, professional, and graduate courses. All requests must be submitted by the student or former student. Requests submitted by parents or any unauthorized parties will not be honored. Paper or electronic transcripts can be ordered anytime by current or former students. Grades and degrees are posted on your record as they are received. If you wish to see your grades by semester, you can view and print them through Student Center. Withdrawal from the institution while such a matter is pending. A finding of responsibility is a finding made by an appropriate university official or officials in a university proceeding, including as a part of an agreement with the student(s) resolving the conduct matter. If the underlying finding of responsibility is vacated for any reason the transcript notation will be removed. Students may submit a written application requesting that a suspension notation be removed to the Office of the Judicial Administrator. Suspension notations will remain in place for at least one year following the completion of a suspension and applications for removal will not be accepted prior to this minimum time period. Transcript notations after dismissal or withdrawal are not eligible for removal. Applications for removal of a suspension notation will be reviewed by the Vice President for Student and Campus Life (VP SCL) or designee. Applications must be 4,000 words or less and include a personal statement in addition to any other information, letters, and/or documentation the student wishes to be considered by the VP SCL or designee. The VP SCL or designee will set a reasonable timeline for handling the application for removal. If an application for removal is denied, the applicant may submit a second application for removal no earlier than six months after denial for the first application. Any subsequent applications by that individual will not be considered. Removal of a suspension notation will have no impact on retention of the underlying disciplinary record pursuant to University Policy 4.7, Retention of University Records and disciplinary record reporting on background checks or other education record requests. The university may also note transcripts pursuant to the procedures set forth in the Code of Academic Integrity. The university will temporarily note a transcript where a student has been temporarily suspended, when a conduct matter is pending as permitted under applicable policies or procedures, and as otherwise permitted under applicable policies or procedures. Such a temporary notation is not subject to any appeal procedures and will be removed upon resolution of the underlying matter. A permanent notation may be made, as set forth above, upon resolution of the conduct matter.